The people who wants to kill the deal are the ones who should get the blame when the Iranians get the bomb in 2 months. With no deal there is no inspection and Iran can do what ever they want. This is EXACTLY what the GOP want so they can have a war in 2016-17 IF they win the presidency. This is about setting up the next president, which the GOP are convinced will be their boy (Carli hasn’t got a snowballs chance in hell), so he will be able to settle the East West/ Modern vs Ancient society argument once and for all. This si about war, not peace. The GOP want war, not peace. First, any foreign “leader” who would trust anybody in DC (Tel Aviv) should be pinned to the ground and sterilized with a soldering iron. Second, anybody who would actually go out of their way to vote for ANY of these criminal clowns and warmongering murderers, including Huckabee, Graham, Hitlary, Cruz, Juan McBush, ANY of them, should be shot though the head at close range for helping to send this country rocketing into full-blown Communism. One more thing. Regardless of what’s been coming out of his piehole recently, the fact that there are people in this country who reproduce, who would vote for Trump, is enough to make a priest curse God. HUCKABEE & his “apocalypse” believers are the ones who would “march them to the ovens” —— or has everyone forgotten that?! 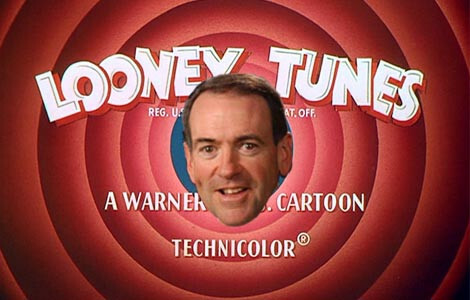 Memo to Mike Huckabee: Make sure Brain is engaged before putting Mouth in gear.